The Eastern High Court on the corner of Bredgade and Fredericiagade in Copenhagen was originally built as an opera house in 1701-03 for King Frederik IV. The architect was probably J.C. Ernst, who later became Master Builder General. It is impressive and richly decorated with half-columns with the red brick wall visible in between. Their characteristic pattern was often copied in Danish architecture of the 1900s. In 1718-21 the building was converted into an officers' academy for army cadets. A good 40 years later, it was converted once again. This time with an extra storey under the eaves. In 1902, architect Martin Borch added the wing that is parallel with Bredgade. Few properties in Copenhagen have served such very different purposes as the Eastern High Court. It initially housed the country's first theatre for ballad operas. But the curtain closed on this about twenty years later. 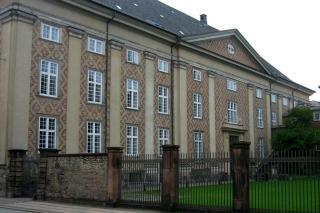 For the next 140 years it was home for Denmark's budding army officers. From 1861-84 it was a barracks for infantry and the engineering corps. When a terrible fire broke out and ravaged Christiansborg Castle in 1884, the homeless Parliament moved into the building. For some years, this was where the politicians locked horns during the provisional period when government was based on provisional laws instead of parliamentary decisions. It was also the setting when the political system was changed in 1901, ushering in Parliamentarism. Parliament didn't move back to Christiansborg until 1918, when the Eastern High Court took over the building.